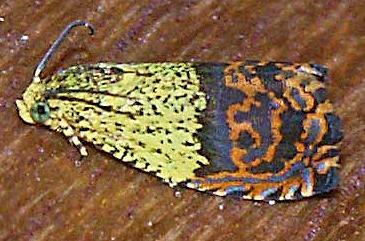 The adult moth has forewings that have a yellow basal half containing black spots, and a blue-black marginal half containing a sinuous red pattern. The hindwings are plain brown. The wingspan is about 1.3 cms. CSIRO Publishing, 2006, pp. 241-242. Volume 40 (1916), p. 536.